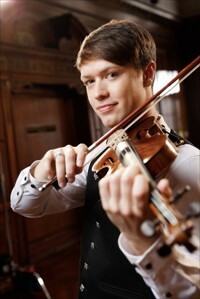 Seán Heely was the 2016 national Scottish fiddle champion, and is an award-winning Irish fiddler as well. He also plays Gypsy swing and bluegrass, and he has recently released his gorgeous debut recording, The Edge of the Bow. A soulful player with sparkling technique and magnificent command of the instrument, Seán has a brilliant future ahead of him. He was kind enough to take time to talk about his path thus far. How did you first get interested in the fiddle? Was there music in your family? I grew up being surrounded by music. My grandmother made all of her children learn an instrument and to sing. So we would have these incredible times at her house with music. She would play the piano and my dad and his siblings would all play their various instruments and we would sing folk songs, sea shanties, and popular songs together in harmony. Growing up like that really developed my ear and gave me a solid musical foundation. My sister played violin in school and I remember hearing it and loving the sound. When I was given a choice in fifth grade, I chose to play the violin. Glad I did! Who supported you along your musical journey? I think an artist always needs people behind them backing them up – a team so to speak. I have had support over the years from within my family as well as enormous amounts of support from close friends of all ages. I was fortunate in that I cannot remember ever being told not to pursue my dream because of the starving artist mentality. Which fiddlers inspired you? Taught you? For fiddling, my most inspiring mentors have been Liz Carroll, Alasdair Fraser, John Turner, Martin Hayes, and Bríd Harper. Any stories about your musical path that you’d like to tell? Coincidences? Magical moments? As soon as I could play a scale, my dad had me playing bluegrass tunes with him on his banjo. My first private teacher, Carol Downing, who coached me mainly in classical technique, had a keen interest in Irish fiddling, so that was my introduction. Magical moments … the whole idea of making music by myself and with others is magic in itself. Did you go to music school? Did you have classical training? How did that help or hurt your fiddling? I have a bachelor’s in Music Performance from the University of South Carolina. Rigorous classical training gave me the skills to do whatever I wanted. It was then up to me [as to] what styles of fiddling I would steer toward. The concept of different dance rhythms in fiddling was probably the hardest thing to grasp coming from classical, where the beat is dictated by a conductor and has many ebbs and flows throughout a single piece. Which came first, Irish or Scottish music? I notice that you play each with a distinctly different style, yet a strong musical personality comes through. How do you achieve that? This is a tough question – which came first. I grew up going to Highland games hearing the Scottish pipes, and I think one of the first Celtic fiddle tunes I heard was Irish. For me, I believe Irish came first with my teacher, as that was what she was interested in. But I had music books by Scottish fiddler Bonnie Rideout and Irish fiddle books, so I was definitely around both at the same time. But I have to confess that from ages 12-17, my interest was mainly in classical music. … It was the first year of college in 2011 that I rediscovered my love of Irish and Scottish music. This grew and grew and was a side thing for me, with all I had to learn and practice for school. But when I started to meet people like Paddy Keenan, Alasdair Fraser, Liz Carroll, John Doyle, Martin Hayes, and all those stellar musicians I had listened to growing up, my interest started to gravitate toward these styles. On my own personality coming through in each style, I was once told by my teacher at USC, after I had played a Bach Sonata: “I want to hear more Bach, and less Seán.” I think I have always managed to put my own feelings and emotion into my playing no matter what style. I have a strong idea of how I want a piece to sound and I go for it! Who are your main influences in each style? Irish fiddle: Liz Carroll, Martin Hayes, Bríd Harper, Tommy Peoples. Scottish fiddle: Alasdair Fraser, Bonnie Rideout, Pete Clark, Paul Anderson. What is distinct to you between Scottish and Cape Breton styles? Cape Breton has evolved its own dance forms for some of the tunes like the strathspey. A more percussive way of playing and the dancing is about making sound. In Highland dancing, the dancers wear soft shoe and it’s more of an elegant dance. Scotland has gone through so much oppression of its culture that we are lucky the music from the 18th century – the Golden Age of Scottish music – was mostly written down. Based on my own observations, the old tunes by composers like Gow, Marshall, Mackintosh, are played more frequently by and large in Cape Breton than in Scotland today. What are your favorite circumstances in which to play? Concerts, kitchens, dances, competitions? I love concerts! Big stages and small intimate settings like house concerts. All have a different energy about them and I find it very rewarding to play with that energy from the audience and harness it in the music and give the audience a pleasant escape from the daily rat race. Competitions are interesting – there is always a formula for winning and sometimes you have to make the decision, do you want to change your way of playing to win a title? How did it feel to win fiddle competitions? How did it affect your playing? … I am very hard on myself if I don’t win. The first competition I ever entered in Scottish fiddling was 2015, and I played all 18th-century tunes, which were all very special to me. I didn’t end up winning anything that year, but listened closely to the first place winner, and said to myself, “Oh, that’s what they want,” and went back the next year after lots of hard work and took the title. Where do you want to take your music in the next 10 years? I have only just begun traveling with my music and I want to keep this up to the fullest extent and share it in many different countries. Recording Edge of the Bow was one of the biggest projects I have ever worked on and it was such an amazing experience. More albums on the way! I love solo work but I would also love to find myself in a regular band, especially while I have the energy to be on the road for months on end. I love creating programs for museums and historic centers, and want to keep pushing my creativity in new ways. What other influences are important to your playing (i.e., pipes, dancing)? For many types of Scottish tunes, fiddles imitate the bagpipes in the ornaments and the choice of notes. For some of the 18th-century tunes, I bring in a more Baroque violin feel with my bow and the way I approach notes. Since both of these types of music are largely for dancing, I like to think about the dance – is it danceable? And then you have tunes that are not for dancing and are for the instruments and for listening. The scope of tunes within these two genres is simply astounding. If you could meet one historical fiddler, now passed away, who would it be and why? I would have to say Scottish fiddler Niel Gow (1727-1807). The stories I’ve heard about this Highlandman’s character and his legendary fiddling are enough to make him the first choice! He left us with some of the most memorable tunes that are still played today, like his “Lament for the Death of His Second Wife.” He also lived at a time where social hierarchy was literally everything, and yet he treated and spoke to everyone equally, no matter their station. For more information, visit seanheely.com.